Why do I need a specific Pokerstars version? Our new and improved way of recognizing weak players/ fishes is not based on visual recognition but rather on a much faster way that can detect the players even before they appear on screen. This can only be done if your Pokerstars version is the right one for us to be able to see the players list. Do I need to use a specific Pokerstars theme? No. Our new scanner lets you choose whatever theme you prefer. Will my other programs still work with this version? We haven’t had any kind of reports for problems with 3rd party softwares. We normally support the latest Stars version, which usually other programs do too, so this will rarely happen. 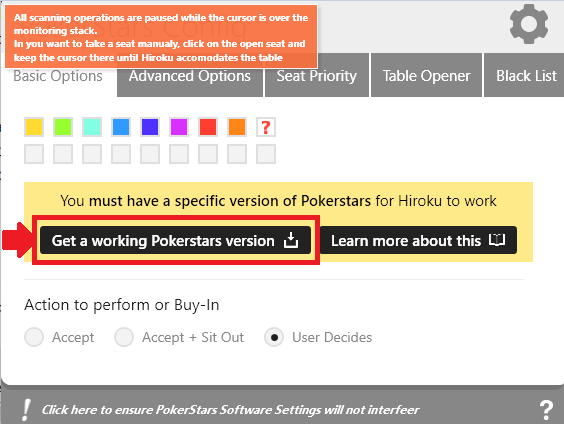 Will changing my Pokerstars version affect my configuration/color tags? No. The folder that is replaced with our tool does not contain your configuration nor your tagged players. Contact us and start your trial today!